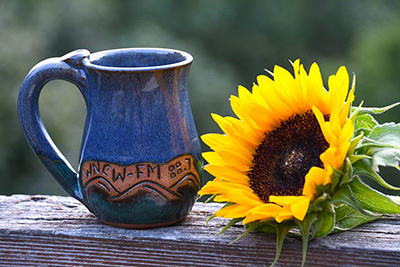 WNCW's newest handmade mug has been crafted by Evening Shade Pottery out of Saluda, NC. It is blue and green with "WNCW-FM 88.7" written over top of hand drawn mountains on one side. It holds roughly 12-15oz of liquid. *Mugs may vary as these are handcrafted.